On the West coast of Menorca, Ciutadella ,was once Menorca’s capital. It reached its' zenith in the 17th century when Menorca’s richest families settled here. When the capital was moved to Mahon, both nobility and church stayed behind and Ciutadella escaped the ideas and architecture that colonial rulers brought with them. The result is a pure Catalan city, stylish and artistic. Stroll down to the port and hire a boat from the harbour side and cruise to a wealth of sandy beaches and coves which ,line the coast. Enjoy the typical Spanish dish of paella, freshly cooked in a quayside café. A visit to the old quarter is a must. Wander along the narrow streets, fanning out from the cathedral, dotted with Gothic palaces, flowered courtyards and chic restaurants and shops. Sip a refreshing cocktail in one of the numerous bars, or dine in one of the quayside restaurants. Barter for goods in the market situated on the steps at the far end of the port or just shop until you drop in the many boutiques that are on offer! Ciutadella is the home of Menorca’s most famous Fiesta San Juan, which draws ,people from all ,parts of Spain. Held on 24th June, fine horses speed through the narrow streets and the squares fill with song and laughter, helped along by copious amounts of gin and lemon! Ciutadella ,is full of atmosphere - a town which is sophisticated and extremely addictive. On the West coast of Menorca, Ciutadella ,was once Menorca’s capital. 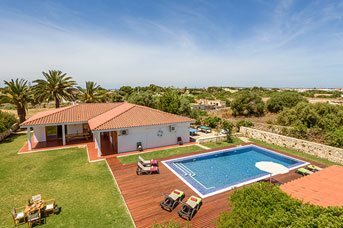 It reached its zenith in the 17th century when Menorca’s richest families settled here. 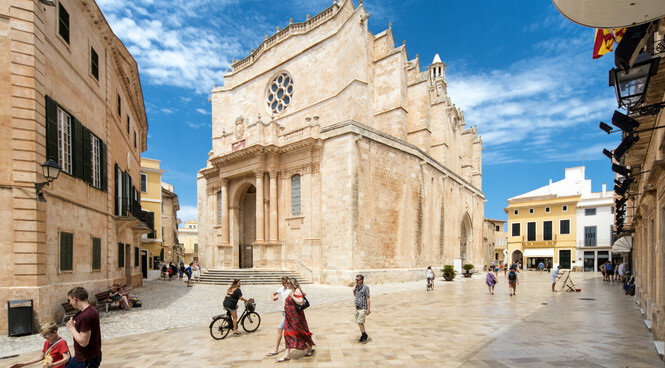 When the capital was moved to Mahon, both nobility and church stayed behind and Ciutadella escaped the ideas and architecture that colonial rulers brought with them. The result is a pure Catalan city, stylish and artistic. Stroll down to the port and hire a boat from the harbour side and cruise to a wealth of sandy beaches and coves which line the coast. Enjoy the typical Spanish dish of paella, freshly cooked in a quayside café. A visit to the old quarter is a must. Wander along the narrow streets, fanning out from the cathedral, dotted with Gothic palaces, flowered courtyards and chic restaurants and shops. Sip a refreshing cocktail in one of the numerous bars, or dine in one of the quayside restaurants. Barter for goods in the market situated on the steps at the far end of the port or just shop until you drop in the many boutiques that are on offer! Ciutadella is the home of Menorca’s most famous Fiesta San Juan, which draws people from all parts of Spain. Held on 24th June, fine horses speed through the narrow streets and the squares fill with song and laughter, helped along by copious amounts of gin and lemon!Ciutadella is full of atmosphere - a town which is sophisticated and extremely addictive.